Only about a fifth of the members of Congress who are debating whether or not to authorize U.S. military action in Syria have any military experience themselves. On Wednesday, the Senate Foreign Relations Committee voted 10-7 to approve a resolution giving President Obama limited authority to attack Syria in response to its government’s reported use of chemical weapons against civilians. Public opinion, however, is leaning against airstrikes against Syria, according to a new Pew Research Center survey. Twenty senators (20%) and 89 representatives (20.5%) are veterans, according to the authoritative Vital Statistics on Congress, published by The Brookings Institution. Among the Senate’s notable veterans: Republicans John McCain (Ariz.) and Lindsey Graham (S.C.), both strong supporters of taking action against Syria; Iowa Democrat Tom Harkin and Kansas Republican Pat Roberts, both of whom have expressed skepticism or outright opposition; and Massachusetts Democrat Ed Markey, who voted “present” on the Syria resolution Wednesday. 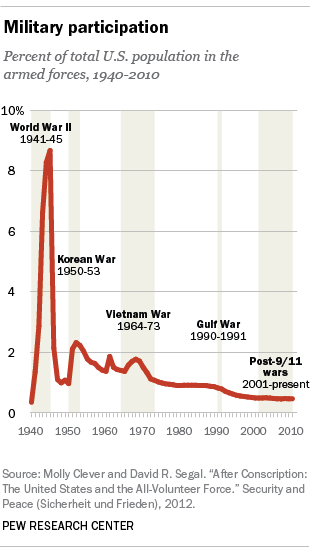 Not all that long ago, military service was practically a requirement for serving in Congress. 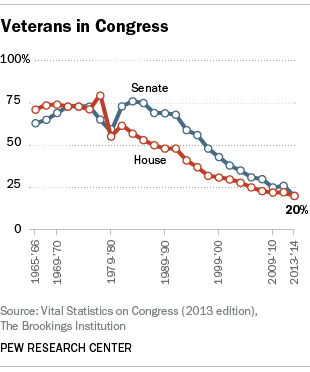 The high point in recent decades was the 95th Congress (1977-78) when, following an influx of Vietnam-era veterans, a combined 77% of the House and Senate had served in the armed forces. But as World War II veterans have retired and relatively few Americans enlist in the all-volunteer armed forces, veterans account for a smaller and smaller share of Congress. That reflects the wider trend in U.S. society. 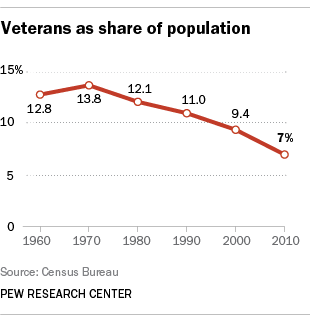 According to Census figures, veterans currently make up about 7% of the overall population, down from 13.7% in 1970 — when the Vietnam War was raging and the draft was still in place. As a 2011 Pew Research Center report noted, the post-9/11 wars in Iraq and Afghanistan have been fought by a historically small U.S. military; this has contributed to a distance between the military and civilian society. While Americans overwhelmingly say they feel proud of those who’ve served and appreciate their sacrifices, 71% say most Americans know little or nothing about the problems faced by military personnel; about as many (74%) oppose reinstating a draft.